So my three gorgeous flatmates and I decided to do shared dinners during the week, which is a fabulous idea as we not only save a huge chunk of cash, but also get to try lots of new and different foods and cooking styles that we might not use ourselves! We all enjoy good food and sharing our cooking so it's quite exciting to look forward to everyone's delicious feasts each week! However.... every single one of 'the flatties' has a food allergy/preference/dislike so it has presented a whole new challenge for us all! Man of the house eat's almost everything and is an amazing cook, but does not eat fish. He works as a fishing guide (Ironic?). He knows a lot about food and cooks everything to perfection providing fabulous tips and feedback on all our meals. I love listening to his knowledge and advice almost as much as I enjoy eating his meals! Soph is vegetarian, gluten-free and dairy free, however, she does eat fish and seafood. She uses a lot of vegetables, beans and legumes when she is cooking. Fantastic for fresh, healthy and tasty dinners! 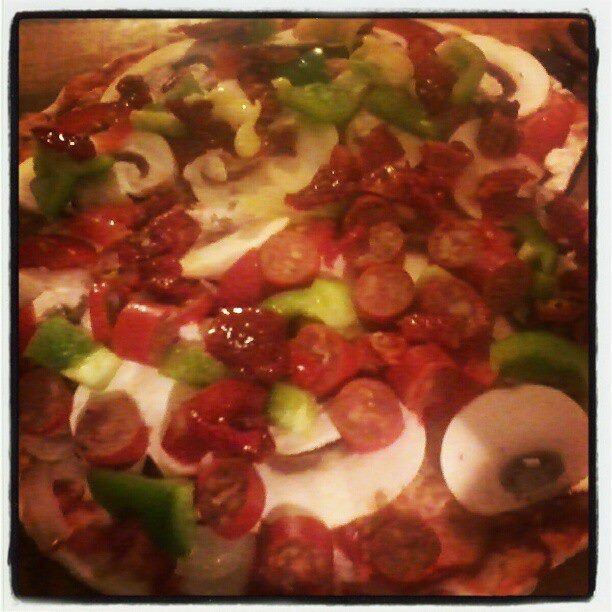 Our pizza night was prepared by Soph, which just goes to show that you can still have amazing and tasty food without any of the 'bad stuff'! B is gluten-free and dairy free, and loves 'meat and veg' dinners. She prefers not to eat seafood or food that is too spicy (unlike the rest of us who love spices and hot food!). B's meals are homely, comforting goodness. Casseroles, bangers and mash and tasty soups give us all our weekly dose of a traditional home-cooked meal. I eat absolutely anything however, I prefer to eat 'clean'. So no flour, processed foods, refined sugar and limited dairy. This works in pretty well considering the others allergies. I enjoy meat occasionally, love love love seafood and believe that the more spice the better! I relish the opportunity to cook for all my flatmates each week and usually have my shopping list written days in advance. I wish I had the luxury of cooking fabulous dinner parties every night but, for my budget, once a week is perfect! herbs - basil, oregano, rosemary..
Drizzle on some oil and bake on 180c until crispy round the edges!